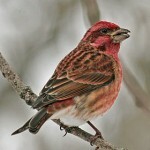 Rich “cheer-lee.” Song is complicated prolonged warble, less variable than House Finch’s. 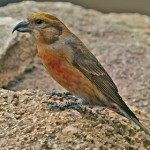 Description: Not really purple but rose red over most of adult male body; color is brightest on head, breast, and rump. Dark brown wings; dark streaking on back; broad brown eye stripe; dark strongly notched tail; and whitish belly. Lacks brown streaking on sides unlike male House Finch. Females and immatures are brown overall, with dark heavy streaking below; whitish eyebrow and mustache stripe. 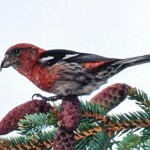 Habitat: Winter birds are mainly associated with woodland streams, and forest edges. Where in Nebraska: Sometimes seen at residential bird feeders. Uncommon spring and fall migrant and winter visitor in eastern Nebraska and the Pine Ridge. Rare elsewhere in the state. Field Notes: Birds in the northern U.S. are migratory, but they only move to the southern states. 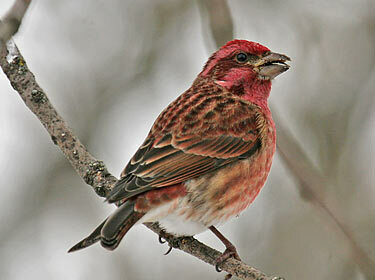 Fun Facts: Purple Finches often incorporate other birds’ songs into their own musical warbling.